Air source heat pumps absorb heat from the outside air. 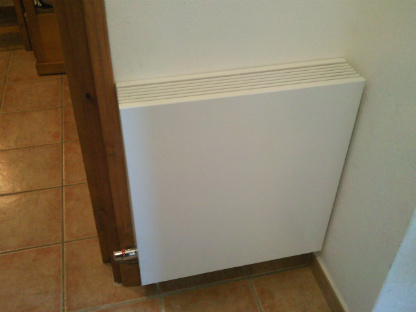 This heat can then be used to heat radiators, underfloor heating systems, or warm air connectors and hot water in your home. An air source heat pump extracts heat from the outside air in the same way that a fridge extracts heat from its inside. It can get heat from the air even when the temperature is as low as -15° C. Don't worry temperatures have never dropped this low in Menorca - the lowest reached in recent history was -2.4° C in January 1985 - oh, and two years previously, in July 1983 temperatures reached 39.6° C! Heat pumps do have some impact on the environment as they need electricity to run, but the heat they extract from the ground, air, or water is constantly being renewed naturally. Unlike gas and oil boilers, heat pumps deliver heat at lower temperatures over much longer periods. During the winter they may need to be on constantly to heat your home efficiently. You will also notice that radiators won't feel as hot to the touch as they might do when you are using a gas or oil boiler. For that reason we normally recommend that underfloor heating is the ideal solution. 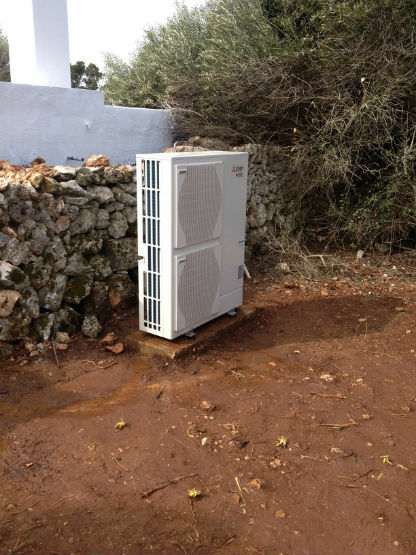 In Menorca, these are generally the preferred option over ground source heat pumps as often the hard rock base makes digging the trenches required prohibitively expensive. We can advise on your best options. Ground Source Heat Pumps have a pipe buried in the garden. Within the pipe circulates a glycol (anti-freeze) & water mix which gently absorbs the heat stored in the ground. This low level heat is absorbed into the fluid and then passes through a heat exchanger into the heat pump then to the central heating system within the house.This can then be used to heat radiators, underfloor or warm air heating systems and hot water in your home. The ground stays at a fairly constant temperature under the surface, so the heat pump can be used throughout the year, even in the middle of winter. 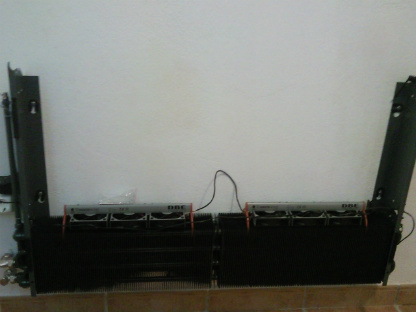 The pipes can be buried horizontally or vertically depending on the space available. Heat pumps do have some impact on the environment as they need electricity to run, but the heat they extract from the ground is constantly being renewed naturally. 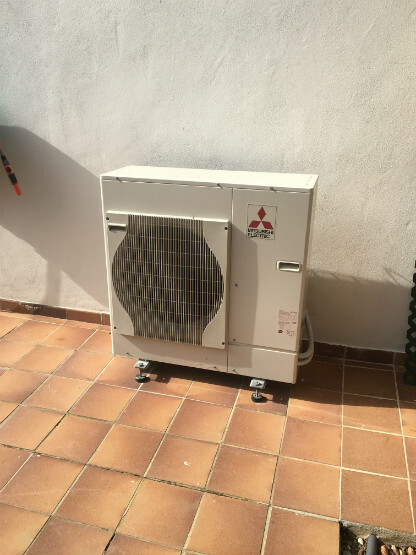 As mentioned above we would need to do a site survey before recommending ground source heat pumps as often the rock your villa is built on will make excavation prohibitively expensive, in which case we would recommend air source heat pumps.